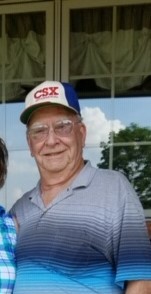 Of Florence, Kentucky passed away October 25, 2018. He was born to the late Audrey and Marie Stone in 1938. In 1956 he married Toni Carson Stone, who survives him. Bill was a veteran of the US Air Force. After 50 plus years “Stoney” retired from the L&N/CSX Railroad in 2000. He spent his time fishing for Crappie and was know as “the Great Agitator Aggravator” while walking at the Florence Mall. But he will always be remembered as a great friend to all. Along with his wife Bill is survived by his children Bill Stone Jr. and Sandy (Jeff) King; grandchildren Jake (Julie) Stone, Mallory Stone and Ari Sizemore; great grandchild Grayson Stone; brother Earl (Grace) Stone; brother in law Harv (Bev) Wolfe; many friends and family. He also preceded in death by his brothers Donald and Howard Stone. A Celebration of Life will be held at the Florence Elks, 7704 Dixie Hwy., Florence, KY 41042 on Friday, November 16, 2018 form 4pm until 8pm. . Please visit www.floralhillsmemorialgardens.com to leave online condolences.